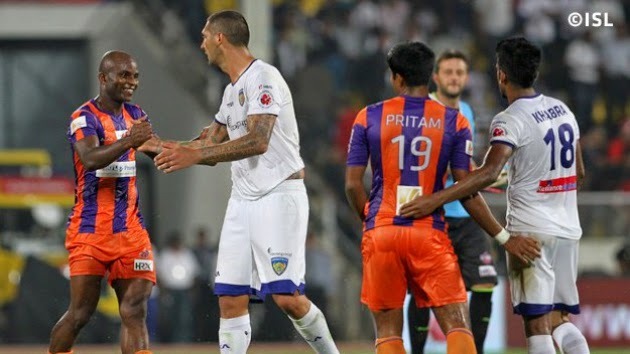 FC Pune City and Chennaiyin FC settled for an entertaining 1-1 draw at the Shree Shiv Chhatrapati Stadium in Pune today. It was a high tempo match with a plethora of chances for both sides. A place at the top of the table was up for grabs for the winner but neither managed to break the deadlock. Kostas Katsouranis put the hosts ahead in the 9th minute with a sublime finish. Elano Blumer missed a penalty a few minutes later but John Stiven Mendoza equalised for the visitors in the 58th minute to ensure that honours were shared. Chennai remain in second spot on 12 points and Pune on third with one less.